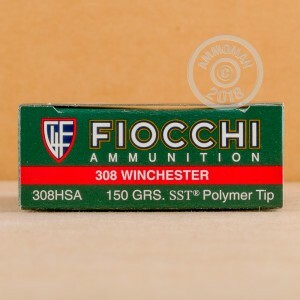 This .308 Winchester ammunition blends the reliability and cost-effectiveness of Fiocchi ammunition with the incredible terminal performance of Hornady SST bullets. 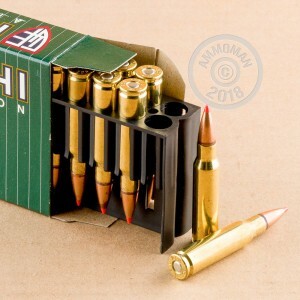 Each cartridge in this box of 20 fires a 150 grain polymer-tipped hollow point projectile at a muzzle velocity of 2,820 feet per second. The Hornady SST's polymer tip performs a number of useful functions including providing an aerodynamic spitzer profile and initiating expansion upon contact with the target. SST bullets have a jacket designed to mushroom outward with the core when the tip impacts them, resulting in maximum energy transfer for clean kills against deer and other game. These cartridges are loaded in Ozark, Missouri by Fiocchi of America and use non-corrosive Boxer primers and brass cases.